Let me start by saying that I believe in the value of all human life. I do not sit down with the intent of portraying Jewish life as being more valuable than other life, rather to defame those who do not, never have nor ever will see Jewish life as being equal in value. I am blessed to have visiting in my home the daughter and son-in-law of Bertus and Geeske te-Kiefte, the couple that saved my mother’s life in Holland during Nazi occupation. During the time we have spent together we have had conversations revealing our similarity in values and our respect for all that is decent and good in the world. We recognize the value of all human life and speak with tremendous honor and respect for those who put their lives in danger to protect others. We share a common value for human life. As a Jew in today’s world it has become strikingly apparent that many people out there do not share the same value for Jewish life and even more worrisome is that it has become clear to me how the world allowed the Nazis to do what they did to the Jewish people. It just didn’t care. Or even worse, it approved. I do not have a persecution complex by any means. In fact I make the argument that there is no reason to go after those who do things that appear to be anti-Semitic if they make claim to not be anti-Semitic. First case in point is Macklemore, who dressed up in a costume during one of his performances that was seen as being a stereotypical caricature of a Jewish man with a big nose. Whether that was his intent or not, his strong claim that he did not mean it to be a portrayal of someone Jewish and that he was not at all anti-Semitic is enough for me to not see him as the problem. Second case in point is the Nike commercial with evil clones taking over international soccer with images on their uniform that could be construed as Stars of David. Nike issued a statement that the image was not intended to resemble a Star of David at all and that they were not trying to draw any connection to Israel or the Jewish people. The Nike statement was also enough for me to not see them as the problem. Is it possible that in both situations we are being lied to and that these are two instances where high-profile celebrities or corporations are subtly trying to demonize Israel and the Jewish people? Sure. But sadly in a world where there are so many blatant, callous, disgraceful and violent attacks on Jews, the subtle attacks are not our problem. The rise in anti-Semitic attacks in Europe, most notably in France, is our problem. The BDS movement’s attempt to cripple the Israeli economy by spewing lies about Israel’s human rights record is our problem. And the kidnapping of three young boys just because they are Jewish and living in Israel is our problem. The kidnappings are telling in so many ways. First of all it identifies the insincerity of the pigs committing the act. They are not freedom fighters battling for the well-being of their people who are attacking enemy combatants. They are cowards filled with hate and evil-looking to harm any Jewish person they come in contact with. The second telling fact is how once again this exposes the fraud that is the United Nations. When a statement comes from the UN stating that it has no evidence that these boys were kidnapped, they sound no different from the standard anti-Semite denying the Holocaust ever happened. And the third and possibly the most telling fact, is the media campaign throughout the Arab world glorifying the kidnapping. 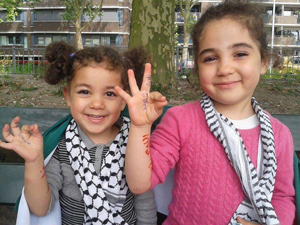 The three finger salute gaining traction and popularity, even being performed by Palestinian children, incidentally children looking happy not persecuted, might as well be accompanied by a resounding Heil Hitler, because it shows as little respect for Jewish life as the Nazis did when they terrorized Europe. I am very careful and reluctant to compare anything to Nazi Germany, but when Jewish life is turned into something of no value, the comparison is dangerously justified. For me to have this forum, a forum established to promote a book telling the story of my parents, survivors of that horror of the Nazis, and to not speak up and speak my mind at this scary time in Jewish history would make me remiss in my responsibility as a Jew and a human being. Never Again means Never Again will we remain silent when we see anyone in the world act as though Jewish blood is cheap. Too many people suffered and died in the past and we can’t allow the same to happen in the future. This is no longer the time to be silent. This is the time to raise our voices and proclaim to the world in the name of all that is decent, Never Again! This entry was posted on Friday, June 20th, 2014 at 3:42 pm	and tagged with anti-Semitic, BDS Movement, Europe, France, Germany, Heil Hitler, Holland, Holocaust, Israel, Jew, Jewish, Lubertus & Geeske te Kiefte, Macklemore, Nazi occupation, Nazis, Never Again, Nike, Palestinian, Star of David, UN and posted in Uncategorized. You can follow any responses to this entry through the RSS 2.0 feed. Well said, David. Sums it up sharply and succinctly.